Their arrest last month hit front pages around the world. Married for only three years and with an eight-month-old baby, they are now in British police custody, suspected of plotting to bring down several U.S. passenger jets over the Atlantic–a plan that, had it succeeded, could have killed thousands. KABUL, Afghanistan (CNN) — The one-eyed Taliban leader Mullah Omar, who heads the religious militia fighting U.S. and NATO forces in Afghanistan, is living in Pakistan, though not in the same area where al Qaeda leader Osama bin Laden is thought to be, according to a U.S. intelligence source. The interpreter’s hand-held radio crackled with the sound of intercepted Taliban transmissions, and he signaled the infantry patrol to wait while he translated. At 7 a.m. one morning late in the summer, peasants were already out scything wheat, with their children tending fields of pink and white poppies that would soon add to Afghanistan’s record-setting opium and heroin supplies. We were 9,000 feet up, in the hamlet of Larzab, in a remote part of Zabul province — the heart of Talibanland. n New Year’s Eve in 1999, Islamist militants had plenty to celebrate. At the Taliban-controlled Kandahar airport, a planeload of hostages was being swapped for terrorists held in India. The hijackers–Kashmiri militants–had managed to secure the freedom of three key allies. Two, Maulana Masood Azhar and Mushtaq Ahmed Zargar, were Pakistani; but the third, a man named Omar Sheikh, was the scion of a wealthy British Pakistani family and had studied at the London School of Economics. No event in recent times has produced as many explanations as the 11th September attacks five years ago. Within the space of an hour, al Qaeda inflicted more direct damage on the US than the Soviet Union had done throughout the cold war, a cataclysm seen by more people than any other event in history. Yet it took only 19 men armed with small knives to destroy the World Trade Centre, demolish a wing of the Pentagon and kill 3,000 people. This mismatch has led some—especially in the Muslim world—to seek a deus ex machina to explain what otherwise appears inexplicable. The usual suspects have been assembled on 9/11’s grassy knoll: the Jews were behind the attacks; the US government engineered them; the “Cheney-Bush energy junta” planned them so that they could grab the oil fields of central Asia, and so on. CNN terrorism analyst Peter Bergen says the notion that Osama bin Laden once worked for the CIA is “simply a folk myth” and that there’s no shred of evidence to support such theories. The announcement in London yesterday of the dismantling of a major terror plot against American passenger flights between Britain and the U.S. provided fresh evidence that the threat of terrorism — whether inflicted by the militant jihadist movement al Qaeda or inspired by it — is still very much with us. 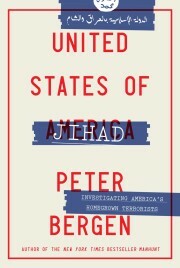 We asked Peter Bergen, one of the few Western journalists ever to meet Osama bin Laden, and Warren Bass, a former 9/11 Commission staffer who is now Book World’s nonfiction editor, to pick the best of the recent flood of books on terrorism.